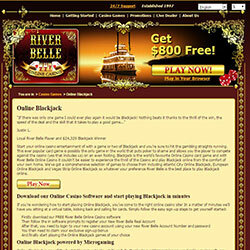 River Belle Casino is one of the net’s biggest and boldest online casinos. They offer a huge array of over 350 games, including nearly 40 different blackjack variations. Their bonuses work with blackjack, but the playthrough requirements are huge. The loyalty program here is very strong, earning players Auction Points alongside regular points. This is one of our top choices for an online blackjack casino. The fact that RiverBelle Casino chose Microgaming as their software developer is not surprising, considering the casino’s drive for quality. Microgaming has a huge game selection, and their Blackjack games especially are very popular with online gamblers. The downloadable version of the software is tiny, and downloads fast even on a slower connection. Once installed, there are 3 games available initially, and the rest are downloaded as you play. Alternatively, the instant play version of the casino offers a smaller game selection, but lets you play on any computer without installing anything! The list of Blackjack games available at RiverBelleCasino is enormous – nearly 40 different variations of this great game can be found in the casino’s various rooms. These variations range from Classic Single Deck Blackjack with all the rules we know and trust, all the way to games like Blackjack Bonanza, which is different than others you might have played. Also available are Super Fun 21, Vegas Strip, Atlantic City, High Stakes, and Double Exposure, just to name a few! The remaining 300+ games found throughout River Belle really cover all the bases. Here you are sure to find all the casino classics, along with a huge variety of Slots, from classic 3-reel machines with a single payline to giant, 25 payline video slots. Lots of table and card games are available too, from roulette and craps to Texas Hold Em and Sic Bo. The variety is mind boggling – it would take months to play through all the games! There is a good startup match bonus available at River Belle – 100% up to $200. Unfortunately, playing blackjack only counts 10% towards the playthrough requirements for the bonus, so it is difficult to make it worth your while if blackjack is the only game you play. Fortunately, an excellent loyalty program is in place to make up for that. It works well with blackjack – every 10 credits you wager earns you 1 regular point and 1 auction point. Regular points are exchangeable for casino credits, and auction points can be used to bid on great prizes! 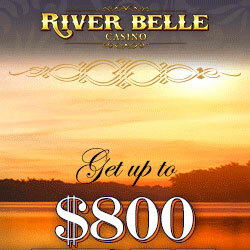 At River Belle Casino, members get access to a huge variety of games and promotions. 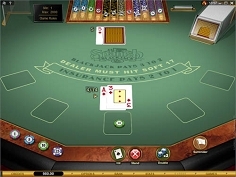 The spirit of the casino is one of exploration, which encourages players to try new games. For blackjack fans this works particularly well, since there are almost 40 different blackjack variations to choose from! Last but not least, the loyalty program that earns players both regular and auction points is one of the high points of River Belle, and is worth checking out!